The Murmansk Mile Sports Festival took place on the shores of Kola Bay in the Russian Arctic on June 27. Participants fought for victory in petanque (a French game involving hollow metal balls), mini-soccer, rugby and sailing, but the most anticipated event was a swim-off across Kola Bay. From the beginning, it was predicted that Petar Stoychev, a champion long-distance swimmer from Bulgaria, would become the winner in the ice swim-off. Stoychev was the first person in the world to swim across the English Channel in less than seven hours. In addition to his many victories in marathon swimming races, he participated in four Olympic Games – Sydney in 2000, Athens in 2004, Beijing in 2008 and London in 2012. Stoychev swam across the Kola Bay for the first time. He covered a distance of 1,200 meters in 16 minutes and 41.39 seconds, but failed to break the record held by Germany's Christof Wandratsch, who crossed the bay in 15 minutes 56.25 seconds in 2014. The first Murmansk Mile Sports Festival was held in 2006 and was dedicated to the 90th anniversary of the founding of Murmansk. Over the years, the festival program has become more diverse and more interesting. Today, the Murmansk Mile and the Festival of the North are two sporting events widely associated with the Kola Peninsula region in the Russian Arctic Circle. Melissa O'Reilly from New York immediately pulled ahead among women. 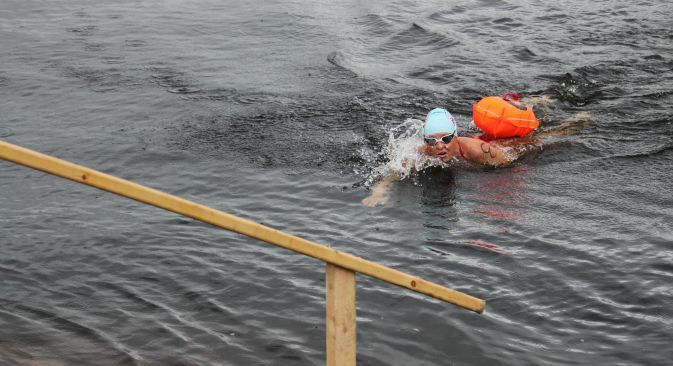 The athlete specializes in swimming in cold water and won the Murmansk Mile in 2013. This time, she swam for 22 minutes and 34.03 seconds on the way to her second gold medal. No sanctions can keep American O'Reilly from visiting Russia; this is her fifth visit to Murmansk alone. The athlete speaks perfect Russian, having studied the language at Princeton University. Safety on the water was assured by rescue officers from the Ministry of Emergency Situations. They assisted four athletes that were unable to complete the race due to hypothermia. The exhausted swimmers were placed on rescue boats and handed over to doctors. After the swim-off and athletic race, the spectators were given a spectacular show. A strongman from St. Petersburg, Artem Tarasov, pulled a locomotive coupled with a carriage. In order to move the metal structure, which weighs 185 tons, the 112-kilogram athlete had to break a sweat. After several unsuccessful attempts, Tarasov managed to make the locomotive move and dragged it for several meters.